"Life is not a problem to be solved but a mystery to be lived"
A young maid dances happily in front of a tree whose trunk contains all colors representing unlimited variety of experiences, the leaves surround the dancer with a cloud of cosmic energy symbolizing unlimited resources. 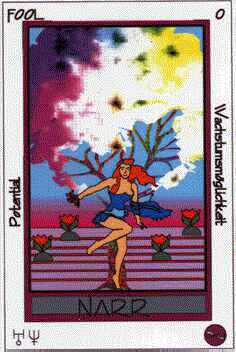 Herself a young flower, she carries flowers in her right hand symbolizing the traditional magic formula "as outside so within". She maintains perfect balance standing on the left toe, almost ready to fly. Small uniform flowers grow on straight lines symbolizing the limited results that restricted approaches yield. Neptune/Uranus: Idealism, spontaneous insights. Theme for contemplation: The unlimited variety and simultaneous simplicity of life. Affirmation: "Everything is easy" Hint: "Have a fresh look at the "facts" of life, read "Zen Mind, Beginner's Mind". 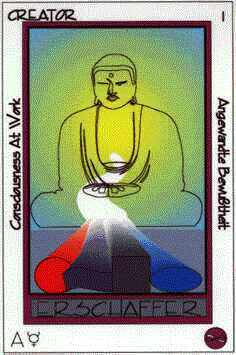 From the heart of a Buddha white light representing non- duality is sent out into the "material world". It condenses into the four elements that all things consist of. The lotus position symbolizes serenity and the facial expression with the left eye open clear intent -thus creating the desired outcome with clarity. Mercury/Ascendant: All-encompassing communication abilities, flexibility. Theme for contemplation: How do I create, on which root-assumption does my world run?" Affirmation: "I am responsible for all elements of my perception, therefore I can create them the way I want them" Hint: Right after waking up sit for a few minutes only and visualize the still missing or incomplete elements of your life as if they where reality, then forget about them for the rest of the day. Read "Creative Visualization". In a full moon night a young girl in white cloth, symbolizing innocence of the heart, sleeps underneath the open sky. A serpent, representing the experience contained in deeper parts of her consciousness, watches over her sleep, protecting her vulnerable state. 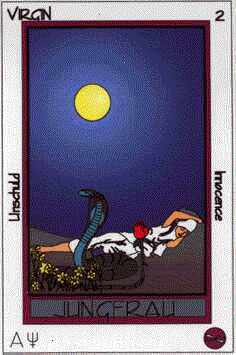 The serpent's tail is transformed into a rose - experience gained and used in innocence leads to beauty. Wild yellow flowers are in full bloom, enhancing the beauty. Neptune/Ascendant: Depth of perception, vulnerability. Theme for contemplation: Truth is the source of my strength. Affirmation: "I am what I am" Hint: Experiment with the "mirror meditation". Sit 15 minutes in front of a mirror in a darkened room, having only two candles lit by the side of the mirror. Try to keep a steady gaze. Do this meditation for 21 days straight.